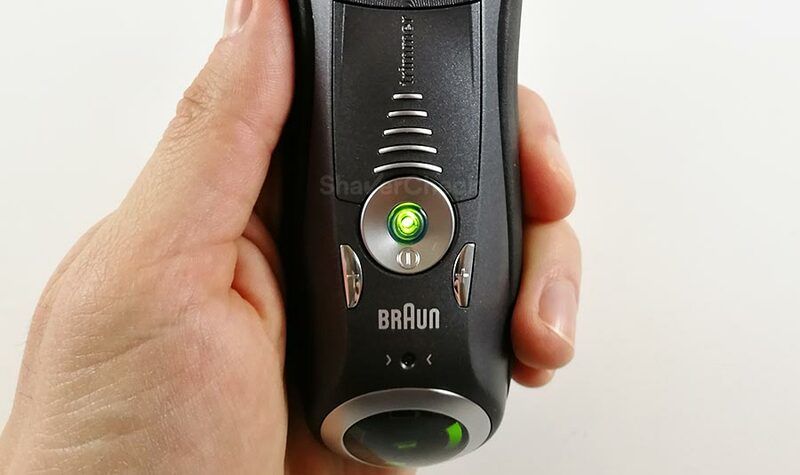 Arguably Braun’s most successful electric shaver, the Series 7 has been widely regarded as the unofficial benchmark in terms of performance and comfort. But with the latest iteration of the Series 5, you may wonder if the Series 7 is still the razor to buy given that the Series 5 offers a few very compelling features of its own. The Braun Series 5 vs 7 debate is multifaceted, but there are only a few aspects that should be strongly considered when trying to decide between the two. In this article we’ll try to objectively present the things that one does better than the other and hopefully help you decide which one would be a better option for you. 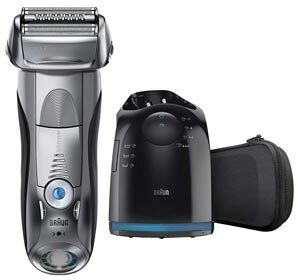 The Series 5 is Braun’s line of electric shavers that fills the gap between the company’s entry-level Series 3 and the more advanced Series 7. The current Series 5 shavers represent the third iteration since the line was launched and includes several variations. For a detailed comparison of all the Series 5 models you can check out this article. The Series 7 was launched in 2010 and quickly became a best-seller. Its strongest assets over the competition were the unmatched comfort during use, excellent build quality and one of the best automatic cleaning systems in the business. Apart from a few differences in color scheme, included accessories or minor features, the actual shaving performance throughout the Series 7 is identical. 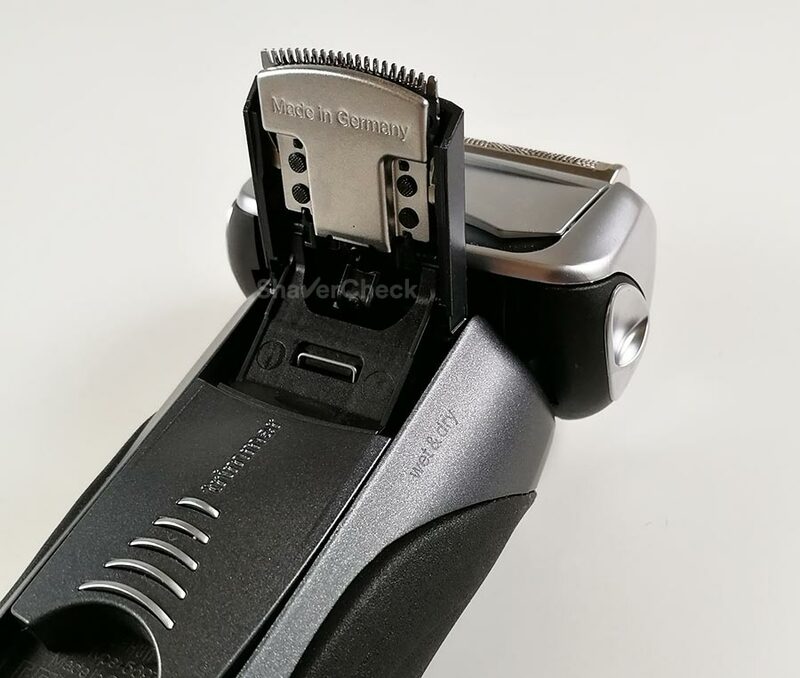 If you would like to read a comprehensive analysis of all the different shavers in the Series 7 family, check out this post. The same is true for the Series 5, so I won’t be necessarily referring to specific models from the Series 5 or 7 in this article, but rather to the two lines as a whole. Let’s now get to the differences between the Braun Series 5 and Series 7. We’re kicking off the comparison with the shaving performance as it’s probably the part that interests a potential buyer the most. 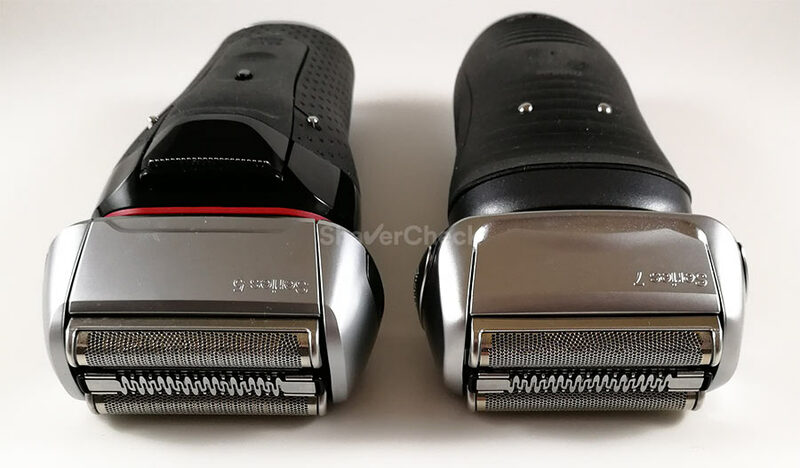 Both the Series 5 and the Series 7 use a very similar shaving head comprised of three cutting elements: two foils for cutting the hairs close to the skin and one middle trimmer that is supposed to lift longer, flat-lying hairs and cut them to a reasonable length for the foils to tackle. 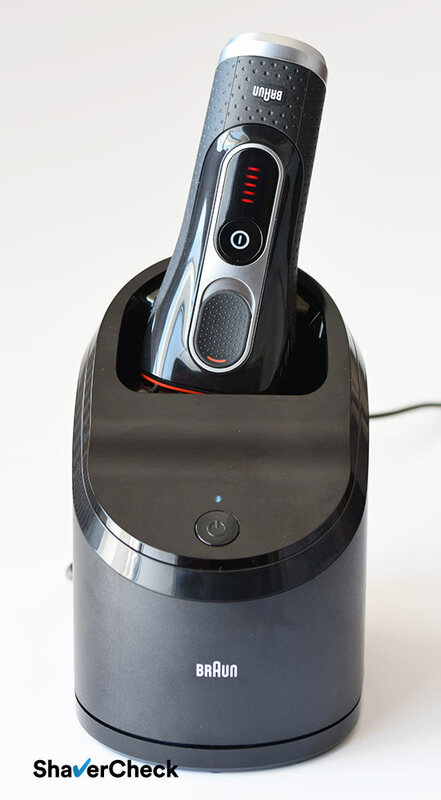 The result is one of the most comfortable shaves of any electric razor. However, the Series 7 has the edge. While the Series 5 is definitely comfortable and adequate for sensitive skin, the Series 7 is more forgiving even when pressing a little too hard. I am yet to make the Series 7 cause me any discomfort, while with the Series 5 I did sometimes experience a bit of stinging and a slight rash on my neck where my skin is extremely sensitive. However, it wasn’t anything too serious and something that I could have avoided with a bit of extra care. The closeness of both the Series 5 and 7, while not quite to the level of a Panasonic Arc 4 or 5 for example, will likely be more than satisfactory for most men. In this respect, the two are extremely similar and I wouldn’t say that one is better than the other. Moreover, if we look closely at the two shaving heads, they look almost identical and the Series 7 cassette even fits the Series 5 perfectly (however, I do not recommend using it in this manner). 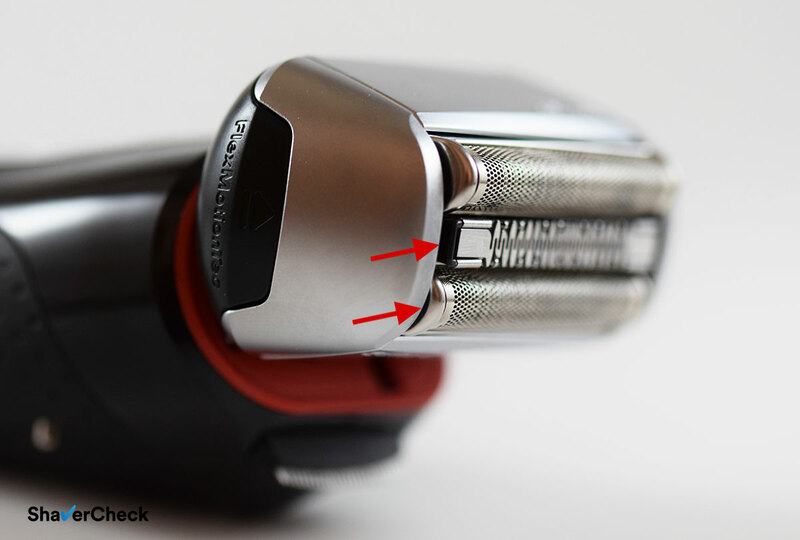 Something that could have an impact on the shaving performance is the so-called Sonic technology found on the Series 7. 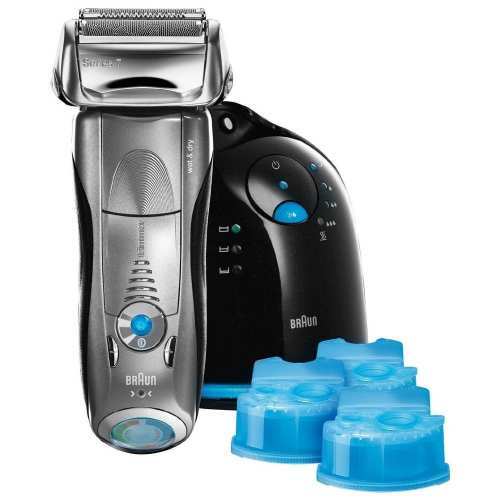 According to Braun, 10000 micro-pulsations per minute make the foils vibrate and lift the hairs for a more efficient shave. And in real-world use, this does seem to make a difference compared to the Series 5 (that lacks this feature). While the Series 5 is surprisingly good at catching longer, flat-lying hairs (definitely better than any other foil shaver in this price range), the Series 7 is better. Precisely, it takes less effort with the Braun Series 7 to capture and cut flat hairs and with fewer strokes. With the Series 5, I had to always go against the grain to successfully capture and cut the hairs, while the Series 7 allowed me to be sloppier and less concerned about this matter. These micro-pulsations also make shaving with the Series 7 feel more like a gentle massage, which makes for a very enjoyable shaving experience. The Series 7 also sounds and feels slightly faster. It produces a higher pitched sound in the highest power setting which may hint at a more powerful motor being fitted to the Series 7. This will result in a slightly faster shaving time in the case of the Series 7. In my case, using the Series 7 does result in a faster shaving session. The Series 5 produces a lower frequency hum, but it seems louder than the Series 7. This is also accentuated by the fact that the razor vibrates very vigorously during use. The Series 7 is more refined in this regard. The Series 7 shavers feature a personalization mode, which allows the user to choose between three or five settings: Sensitive, Normal and Intense. The newer models (like the 797cc or the 7865cc) have 5 settings. Selecting one is carried out by pressing the two buttons located just below the power button. This allows you to alter the power output of the motor depending on the area you are about to shave. For example, you can choose the Sensitive mode for your neck. In practice, this again seems to make no real difference and it’s safe to say that it is just a marketing gimmick and you should always use the most powerful setting as the shaver remains adequately comfortable at all times. The lower speed setting will just make the Series 7 feel slow without any noticeable improvements in comfort. It’s probably the reason why Braun decided to ditch this feature with the new Series 9. If you were to shave half your face with the Series 7 and the other half with the Series 5, the results will most likely be very similar, especially in terms of closeness. 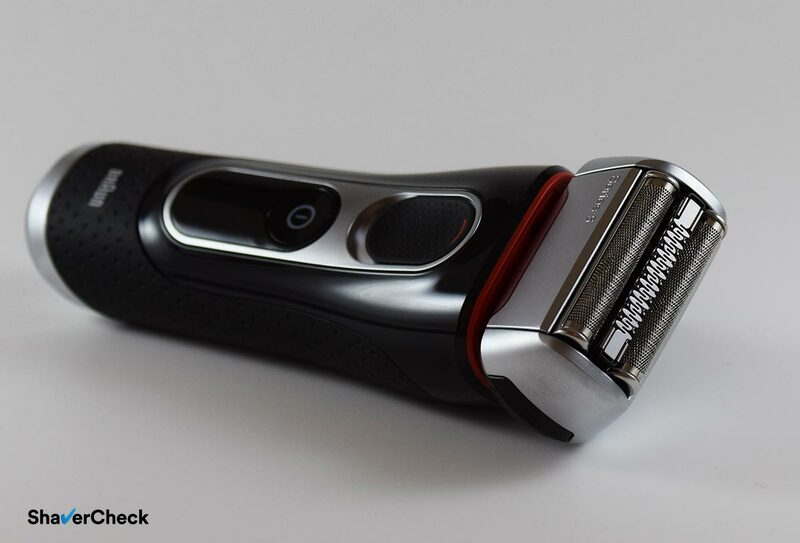 How you actually get to those results is a slightly different story, with the Series 7 having the edge in this regard as the shaving experience is more enjoyable and the time it takes to complete a shave can be shorter. The body of the Series 5 vibrates quite vigorously and makes more noise when cutting the hairs, while the Series 7 feels more refined. But again, the end result will be very similar. 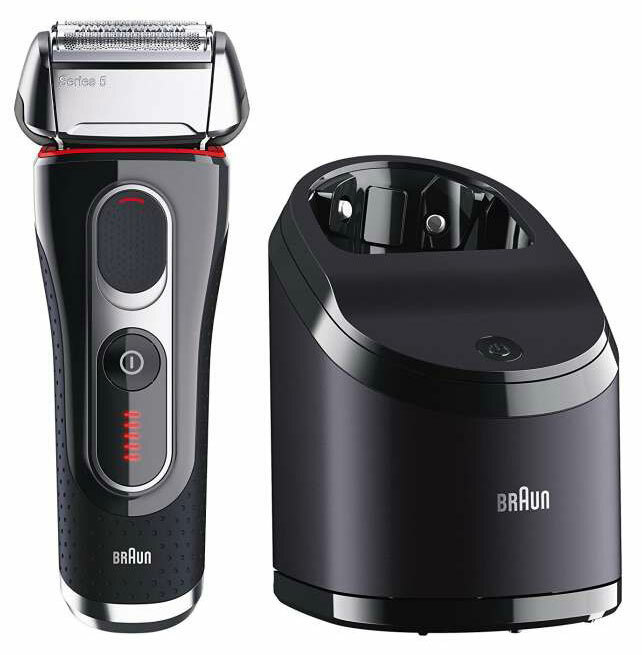 The Series 5 incorporates Braun’s current design language that we first saw with the introduction of the new flagship shaver, the Series 9. Those two shavers are actually quite similar in terms of design and size. The Series 5 even tapers towards the bottom, again, just like the Series 9. From an aesthetic perspective, the Series 5 is undoubtedly one of the best looking electric shavers out there and stands out more than the Series 7. The sleek shape, along with the striking black, red/blue and silver color scheme definitely make the razor look like a premium product. Again, it’s actually quite similar in terms of design and proportions to the Series 9 shavers. Even though it is larger than the Series 7, the ergonomics of the Series 5 aren’t affected and it feels nicely balanced. The generous, textured rubber insert ensures an excellent grip in any conditions. The design of the Series 7 is understated and even a bit dull compared to the Series 5. That’s not to say that it looks bad. But side by side, the Series 5 stands out. Having said that, the build quality of both shavers is very good and this is one of the things that Braun is renowned for. One noteworthy aspect concerning the ergonomics of the two shavers is the size of the shaving heads. Even though the actual cassettes are almost identical in size, the frame surrounding them is a bit larger on the Braun Series 5. 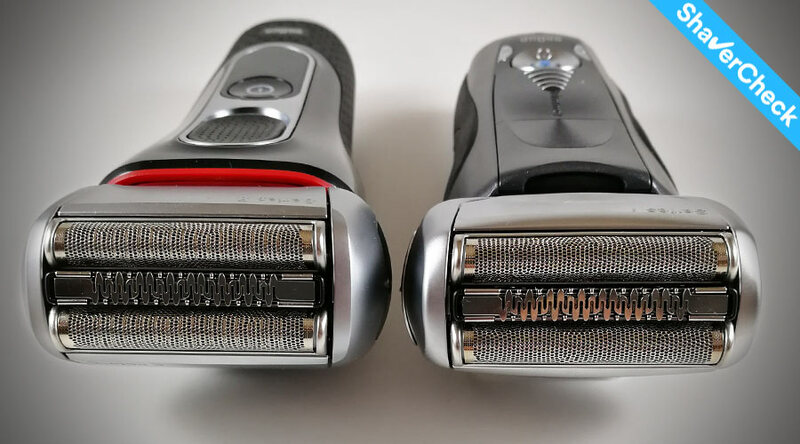 While not that obvious from a side by side comparison, this makes the Series 7 feel a bit more nimble and easier to use when shaving tricky areas like under the nose or the jawline. Oddly, the Series 7 doesn’t feature a travel lock. There is no way to physically deactivate the ON/OFF button. You could argue that it is very small and rather difficult to press, but that hardly counts as a travel lock. 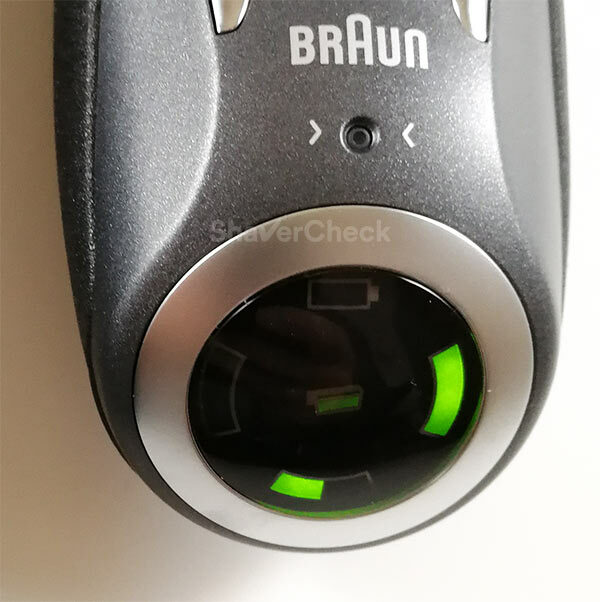 Braun addressed this shortcoming with the Series 5 and you can activate the travel lock by pressing and holding the ON/OFF button for 3 seconds. 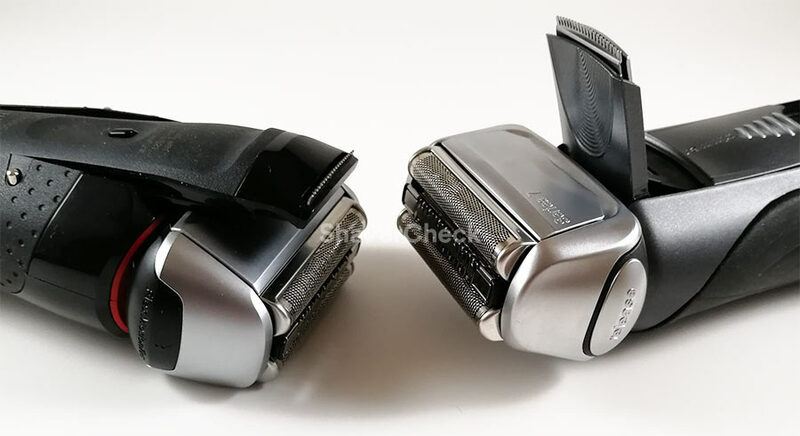 The shaving heads of both the Series 5 and 7 can move back and forth and they work really well for maintaining constant contact with the skin. But there are situations where more precision is required, so the shavers offer the possibility of locking the head into a fixed position. When activated, it also lowers one of the two foils to make the shaving head even slimmer, which is great for finesse work. The switch is located on the front of the Series 5 and on the shaving head itself for the Series 7. However, the actual implementations of the locking mechanisms are different. If you force the shaving head of the Series 7 after being locked into place, the mechanism can literally break. This is quite common among Series 7 users and it’s even acknowledged by Braun. As a result, you must be extra careful when using it as the warranty won’t cover this type of damage. The problem was addressed for the Series 5 and if excessive force is applied, the head will simply move and lock into a different position, with no damage done to the ratcheting mechanism. Even if the hair trimmer on virtually all electric shavers can only be used for touch-ups and light grooming, they are definitely useful. The Series 5 and 7 feature a hair trimmer, but the implementations are very different. The one on the Series 5 is located on the back, just like the one on the Series 3 and 9. This positioning is very good in theory from an ergonomic standpoint, but unfortunately on the Series 5 it doesn’t really extend beyond the shaving head and you can’t really see what you’re doing. 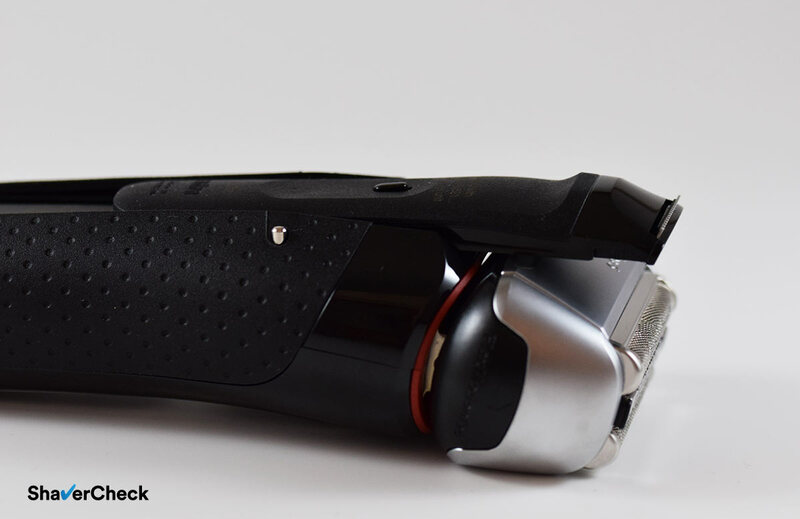 The Series 7 has a pop-up trimmer located on the front of the shaver that sits perpendicular to the body of the shaver when deployed. This solution also suffers from the same problem as the shaving head obscures the trimmer. Removing the cassette before using the trimmer should make things a bit easier. Regarding the actual performance of the trimmers on the Series 5 and 7, it’s pretty average and neither is particularly good. While they are adequately wide, I don’t really like the curved profile and they just don’t seem to cut as efficiently as the trimmers on Panasonic shavers for example. They’re also not suitable for trimming your entire beard if you haven’t shaved for a longer period. It will take ages and probably won’t be an enjoyable experience. Just use a regular hair trimmer if that’s the case. The Series 5 also comes on top when it comes to displaying useful information, like remaining battery and hygiene status. The display is clear, simple and very legible. It’s also conveniently placed on the front of the shaver. The Series 7 has a circular LCD display awkwardly placed at the bottom on the razor. It’s very dim and difficult to read, especially in a darker room. Some of the newer Series 7 models like the 7865cc come with an updated LCD display. While it’s adequately bright, it’s not particularly useful and many users seem to be confused by it (and rightfully so). 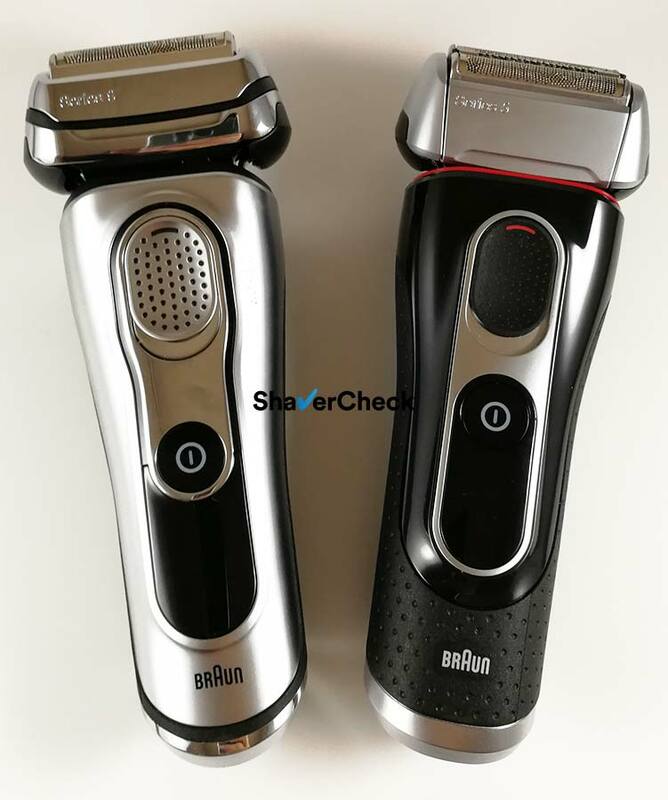 As mentioned at the beginning of this Braun Series 5 vs 7 analysis, you can opt for a shaver that comes with or without an automatic cleaning station. And while I don’t usually consider them to be necessary, especially in the case of easy to clean foil shavers, I will actually suggest going for a model that includes one in this case. The solution also lubricates the foils and blades. With that said, the automatic clean & charge stations that come with the Series 5 and 7 have a few important differences. First, the one included with the Series 7 is more compact. So if you have limited counter-top real estate, take this into account as well. The Series 7 stations used to be fitted with an induction heating system for drying the shaver after the cleaning cycle has ended. This ensured a completely silent and fast operation. However, Braun recently ditched this feature along with the quick cleaning mode for all Series 7 models that are currently being manufactured, including the 790cc. You could still get it with the older 790cc/799cc/797cc if you can still find them. A significant difference between the Series 5 and 7 is that you can use the Series 7 s (solo) models (like 7893s, 740s etc.) with a Series 7 cleaning station, while in the case of the Series 5 you cannot. The Series 7 solo models are the only ones fitted with the special chip required to communicate with the stations. Finally, the Series 7 station looks subjectively better, especially compared to the one that comes with the Series 5 which has a rather cheap look. Apart from being bulkier, the automatic cleaning system of the Series 5 also doesn’t have an active element that dries dry the shaver. As a result, it will take 3 to 4 hours for the alcohol solution to evaporate naturally. This is probably one of the corners that had to be cut in order to keep the price of the Series 5 low. 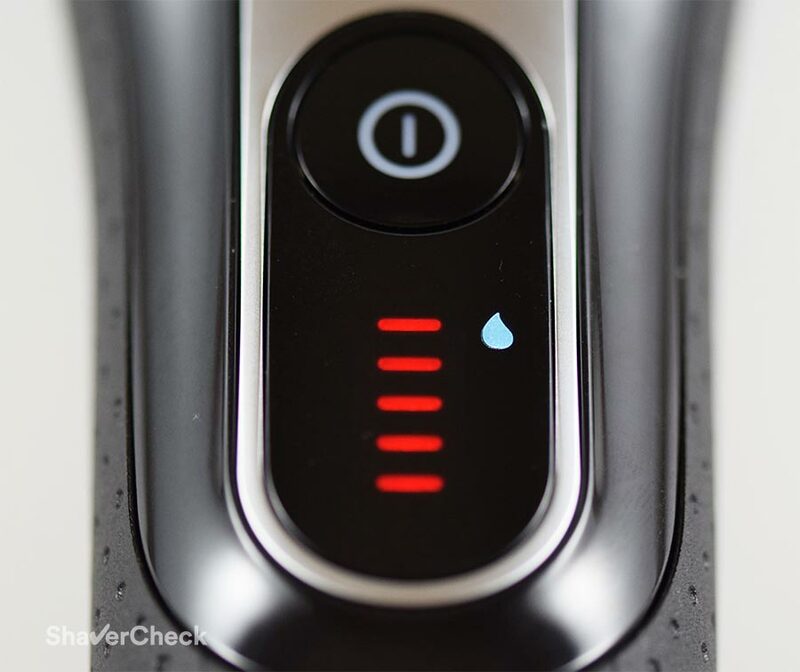 The end result — a clean, sanitized, lubricated and fully charged shaver — is still the same. Besides, you probably won’t need to use your shaver within hours of completing a previous shave. It’s worth mentioning that only the 5090cc in the Series 5 comes with a station that analyses the hygiene status and selects one of the three cleaning modes accordingly (short, normal, high intensity) like the one from the Series 7. The other two, namely the 5070cc and the 5050cc only have one standard cleaning program. Another minus for the Series 5 is the lack of a wet & dry shaver available with a cleaning station. So if you plan on using your electric razor with a shaving cream, your only option is the Series 7 799cc or other wet & dry Series 7 variant as the Series 5 only offers dry only shavers with a clean & charge base. 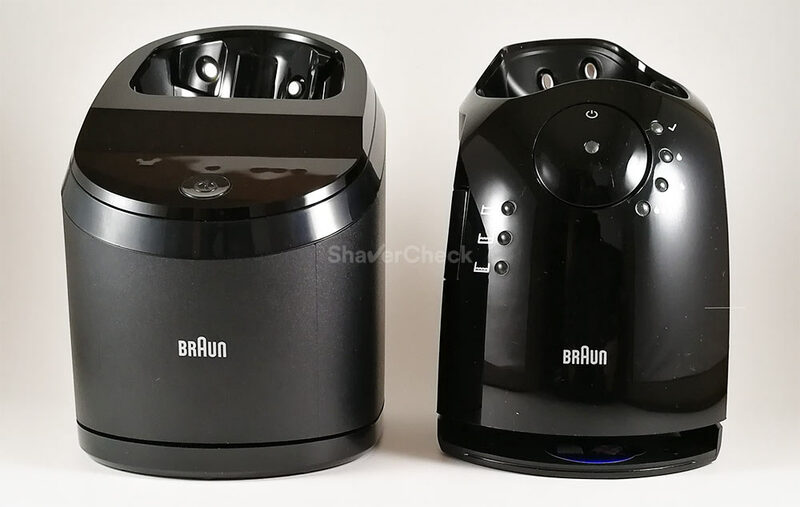 Actually, Braun rolled out a small update to the current Series 5 shavers, called the Series 5² and all the updated models, including the cc ones that include a cleaning station, are suitable for wet & dry use. More details here. However, these new models aren’t available for purchase yet. I will update this post once they become widely available. 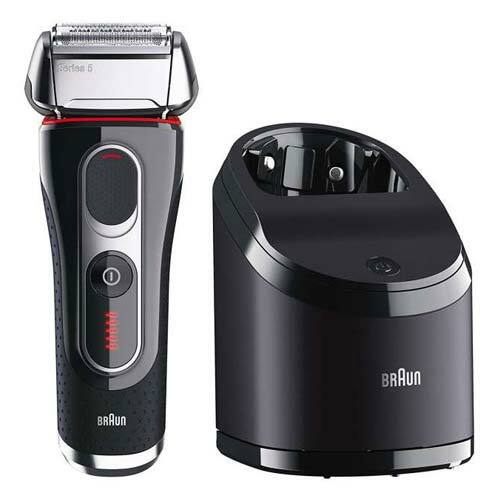 UPDATE: The Braun Series 5 5190cc wet&dry is now available. Probably the biggest shortcoming when it comes to Braun’s cleaning stations is this very odd limitation. If you use shaving cream with your wet & dry shaver, regardless if it’s a Series 3, 5, 7 or 9, you must first clean it manually of any foam and soap residues before using the cleaning station. If you don’t the station will clog and stop working eventually. This is definitely something you should keep in mind if you plan on using your shaver with creams and gels and maybe even looking at other options from Panasonic or Philips Norelco. For dry shaving, this is a non-issue and the cleaning stations perform very well. We are all interested in reducing the initial investment and the cost of ownership. Let’s see how the Series 5 and 7 fare in this regard. As expected, the Series 5, being the lower end product, costs less. The difference in price compared to a similarly specced Series 7 (for example a Series 5 5090cc vs a Series 7 790cc) can be pretty significant. Things are usually the same in the case of the replacement shaving heads (cassettes). The price for the cassettes compatible with the Series 7 has seen a big spike lately; as a result, they cost a lot more compared to the price of a Series 5 cassette. And we’re talking about parts that are almost identical in design and performance. This is where the Series 5 starts to seriously become the better option. While the Series 7 has the edge in terms of performance and cleaning stations, but only slightly, the cost savings implied by the lower price of the Series 5 and of the replacement shaving heads can tip the scales in its favor. This is the biggest asset of the Series 5 in my opinion, price and value for money. Braun Series 5 vs 7: when should you choose one over the other? Choosing between a Series 5 and a Series 7 can be difficult. And even more so when dealing with shavers that offer similar performance, but also have pros and cons. Both the Series 5 and 7 are two excellent choices that are able to provide some of the most comfortable shaves. And this comes without a significant trade-off in the closeness of the shave, which still remains more than adequate. You’ll likely be very satisfied with the end results by choosing either of them. My advice would be to simply go for the one that would suit you better considering the pros and cons presented in detail above. Personally, I would opt for the Series 7 as it’s more enjoyable to use, a bit faster and more comfortable. However, for someone that doesn’t have very sensitive skin or is not particularly interested in the other aspects, spending more on a Series 7 may not be justified. The Series 5 is cheaper to buy and to run and it offers pretty much the same performance as a Series 7. The Series 5 5090cc that we reviewed in great detail here can usually be found at an excellent price and comes with the full option cleaning base. The 5190cc is an equally good option if the 5090cc is not available in your country. And like I said, with the Series 5 or 7 you’ll probably want the cleaning station too. Manually cleaning either of the two is fiddly and it takes away some of the fuss-free awesomeness of using an electric shaver. Having to remove hair clippings, dirt and dried shaving cream from a single piece shaving head is not something to look forward to. Regarding the Braun Series 5 vs 7 decision, here are a few general guidelines to help you make a pick. You don’t have a very sensitive skin. You can get a really great deal on one. Home » Articles & Guides » Head to head » Braun Series 5 vs 7: Which One Should You Buy? Great review. I have both the Series 5 & 7, as well as several other brands. I find that I come back to the Series 5 more frequently than any of the others. It seems, to give the closest and most comfortable shave. The rotary shavers, Norelco and Remington are useless, and Panasonic is well made and does a great job, but it is very noisy. Very helpful review. Thanks so much. You are very welcome, glad you found it useful! Hi, this may seem an unusual question but would a series 5 shaver work with the series 7 charge station? I’ve owned a series 7 with the charge station for a few years now & the trimmer broke a few months ago. The blade unit is now broken & I honestly wasn’t impressed at all with the series 7, especially for the price so I’m thinking of getting a series 5 if it works with the charge station, if not I think I’ll just try another brand this time. Hi, unfortunately no, the Series 7 cleaning station will only work with a Series 7 shaver that was designed to be used with one, like the 790cc for example. The models ending in s like the 740s won’t work either. If you weren’t satisfied with the performance of the Series 7, going for a Series 5 wouldn’t be the best approach as they are pretty much on par with regards to shaving performance. You can also check out the Panasonic Arc 4 line, they are very good performers for the price. will the 7 series model which does not come bundled with a charge/clean station function if using charge/clean station sold separately? No, it won’t work. Only the models that originally came with a station – the models ending in cc – will work with a cleaning station. If you buy an s model that doesn’t come bundled with the station and you plan onm getting the station separately later on it won’t work. I asked Braun that .No it wont work.I think hardly any series will work with other series.They got you bye the series. I have used Norelco’s since the 1 head in the late 1940’s.The last great Norelco was the 3d Senso Touch,after that they ruined the shaver in the 8000 & 9000 series,shaving became painful.I bought a Panasonic E5-LA63 quite a good shaver ,but noisy .Years ago after many complaints to Braun about a rogue service center ,they sent me the 550cc Braun which I used from time to time but mostly for the trimmer .Recently I went back to the 550cc after replacing the blades and found it gave me a better shave than the Panasonic.I lost the clean and charge station that came with the 550cc ,so I just purchased 5090cc which I can use the clean and charge station with my 550cc.Frankly ,I’m confused about the 7 series versus the 5 series but concluded that there was so little difference between the two that saving $50 for the 5 series made more sense.I think that having the cleaning and charging station will be a big plus for me.Thank you for your great review ,I almost refused the shipment for the 5 series and was going to buy the 7 series.That would have been a big mistake. Thank you for your comment, Hans. I’m glad it helped you out. Just one thing, I’m pretty sure that you can’t use the cleaning station of the 5090cc to clean your 550cc razor. The stations are different in design and the shavers themselves use different shaving heads. I currently have a 790cc of 8 years and it becomes noisy … so I think to change it to a new model ; what do you think of changing it to the 7898cc/7899cc especially if the price is currently +/- 165€ – 30€ of cashback ? My Series 5 5090cc is noisier than all the Series 7 I’ve used so far, especially during use when it vibrates quite strongly. If you were satisfied with the performance of your Series 7, you’ll feel right at home with either of the 7899cc or 7898cc. Performance-wise they are identical to the 790cc. The only differences is that they can be used wet or dry and the cleaning stations lack the quick cleaning setting and the induction drying system. If that’s not a deal-breaker, I think they will be a very good option in this case. Great review. Unfortunately, I am still confused in choosing one between 797cc and 790cc. My Series 5 is almost gone, and I am considering to have either 797cc or 790cc. Would you please advise which one is really better, especially, that I am also wondering why the price of 797 cc is cheaper than that of 790cc in Canada. They are absolutely identical with regards to shaving performance. The 797cc can used wet & dry, while the 790cc can only be used dry. Depending on your preference for wet or dry shaving, you can opt for either of the two. 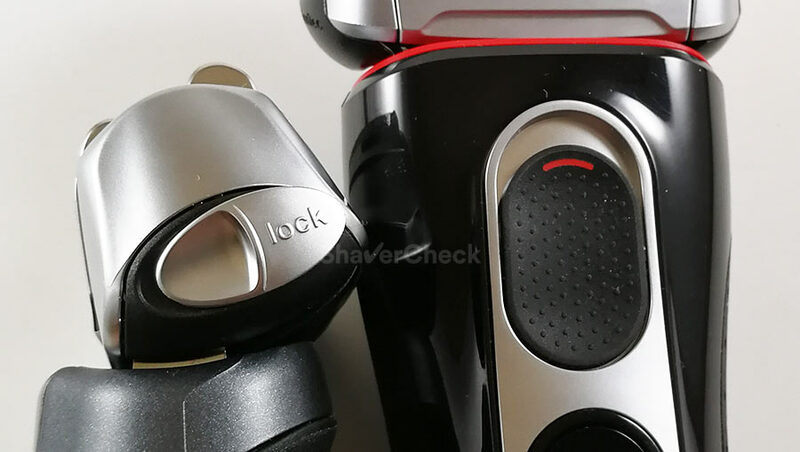 A bonus for the 790cc would be that you can also use the shaver while it’s charging (with the cord plugged directly into the shaver). The price for the different Series 7 models can vary tremendously. Personally, I would go for the cheaper one. Excellent review and I appreciate the worthwhile information. I currently have a Braun Series 5 and was considering upgrading to a Series 7, but after reading your review I changed my mind. My Series 5 shaves very comfortably but my biggest complaint is closeness. For a smooth shave I have to make several passes and use a good bit of pressure. Also, for me the shaver itself is somewhat bulky and the head is too large for certain areas of my face. So rather than upgrade to the Series 7 “twin”, I went with a Panasonic Arc 3. Not as comfortable of a shave as my Braun Series 5, but shaves a LOT closer in less time. And the smaller size is much less cumbersome. Thank you for your review! Thank you for your kind words! I’d say that you made the right decision with the Arc 3. The Series 7 is clearly NOT a significant upgrade from a Series 5, particularly if you’re concerned with getting a closer shave. They are pretty much identical in that regard. Panasonic on the other hand excels at providing a very close shave, even the entry-level Arc 3 models are fantastic performers. I’m French and had difficulties to find good info on shavers in french site. Thanks a lot for all good info you’re providing us. I use a Braun serie 3 since 1 year. I like it but I have difficulties to shave in the neck and near the beard (i wear small beard around the mouth). 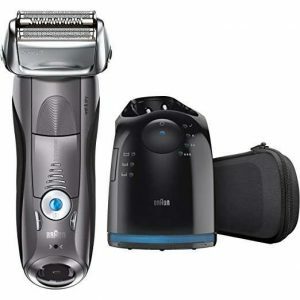 I’ve purchased philips serie 9 and thought (before reading your blog) that rotary shaver would help for flat, lying hairs but after 1 week I find it worse than my Braun 3020s. I always finish with my Braun to have a closer shaving. My technique is surely not good. Also the big head of philips is difficult to have precision. 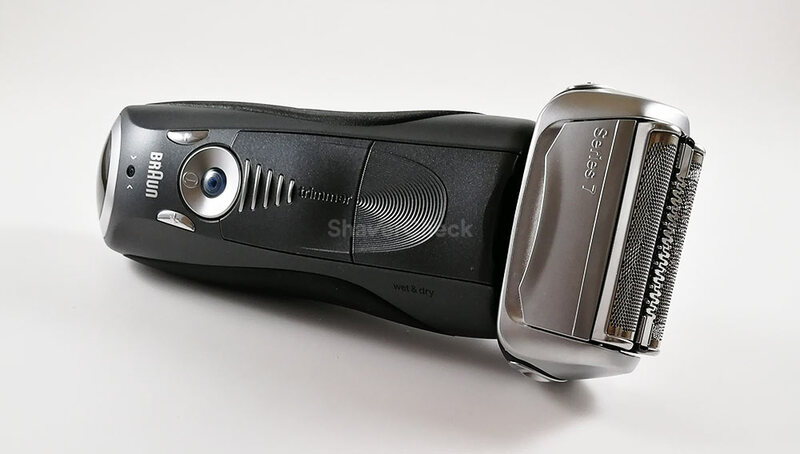 Do you think that a serie 5 would really improve my shaving, will reduce time and difficulties to shave flat hairs, growing in every directions? Or would a Panasonic be a better choice? I would like to stay with small heads to keep precision to cut Under the neck, and around the beard. Thank you for your comment, Ludo. In theory a rotary razor should be better at handling flat lying hairs compared to foil shavers, particularly the entry level models. However, your technique also counts and sometimes — for reasons that aren’t exactly logical — one type of shaver simply works than other. For example, I always get a better shave with foil-based electric shavers. Compared to rotary razors, the closeness, precision and comfort are superior in my case. Since you’re actually getting better results with a basic Series 3, a shaver that (at least in theory) should be blown out of the water by a Philips Series 9000, I think it makes sense to try a more advanced foil shaver. The Series 5 seems like a good fit for you. It has 3 blades, so it is reasonably nimble, has plenty of power and it handles flat lying hairs very well for a foil shaver. I’ve used both a Series 3 and a Series 5 and the 5 is vastly superior in every aspect. 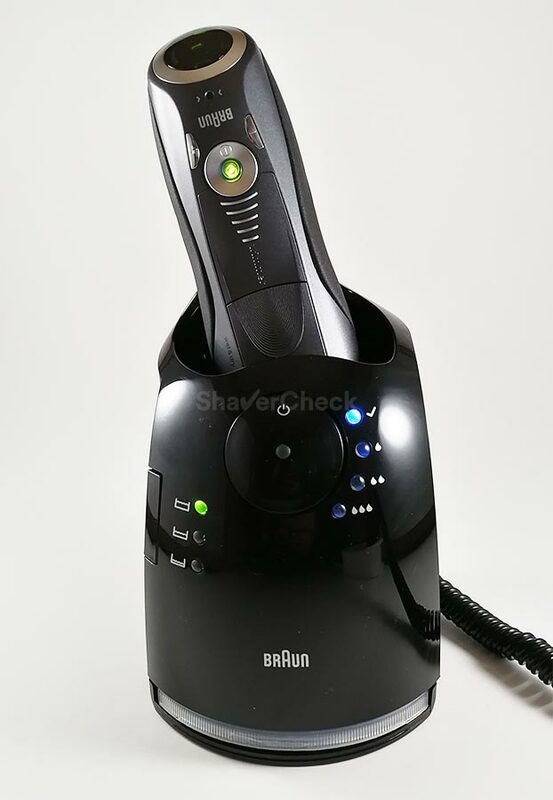 Regarding Panasonic shavers, I personally think they’re fantastic performers (closeness, power and wet/dry use), but I don’t find them as good as Braun razors (Series 5, 7 and 9) for shaving flat lying hairs that grow in different directions. Otherwise they would have been a good choice as well. Maybe just the Arc 3 since the other models come with 4 or 5 blades and their heads are very bulky, clearly not ideal for shaving around a goatee. thanks for your answer, it helps me finding my way out in the jungle of shavers world. For sure my technique with rotary shaver is not good. But as I don’t find it really practical compared to foil I’ll stay with foil shavers. Apart from the rather minor differences in shaving performance outlined in the article, the two are very similar and you can’t really go wrong either way. If your budget allows it, go for the Series 7. It is more refined and the cleaning station is more compact. Otherwise, the Series 5 will be cheaper to buy and the replacement shaving head also costs less. I have Braun Cruzer 6 Clean Shave but i think to change it for Series 5 or Series 7. I have soft and bright hair and sensitive skins that’s why I shave every 3 days. Is the 5 or 7 series is much better than Cruzer 6? Cruzer is like Series 3 or worse? I have lots of flat-lying hairs that grow in different direction and especially i have problem with hair on throat. Cruzer irritates my skin and i must to spend a lot of time to shave well. I don’t want to spend too many moneys for new razor (more than my computer graphics card) but i don’t want also to risk bad product to my hairs. Is the Series 5 5190cc is enough or i must buy example Series 7-7790CC? At this moment i prefer Series 5 (price and maintenance costs). Greetings from Poland and sorry for bad english. 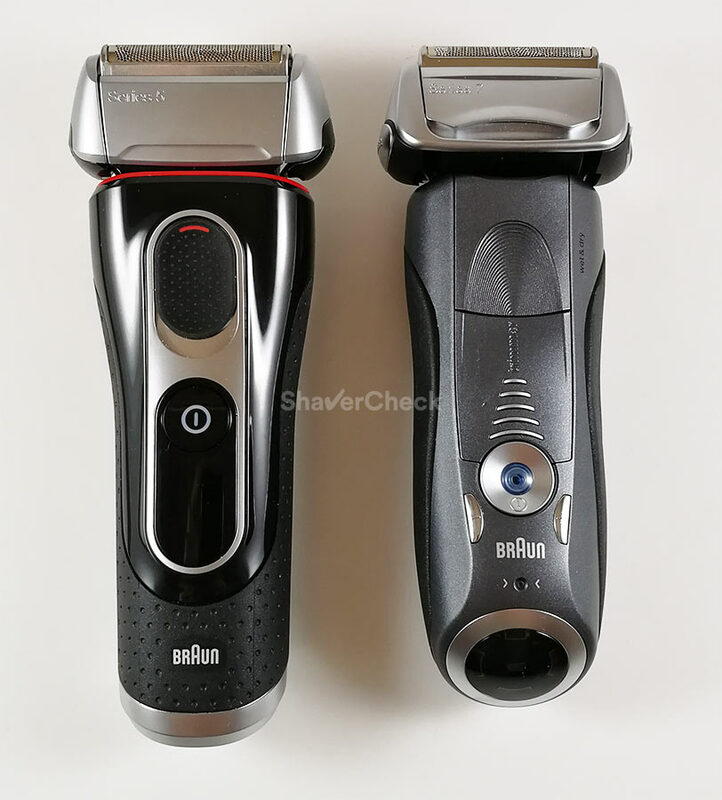 The Cruzer 6 is actually worse than a Series 3 in my opinion (when used as an electric shaver, so without any comb attachments). A series 5 or 7 should be a clear improvement over it, both in terms of comfort and how it deals with flat hairs. Regarding which one to choose, if your budget is limited, the Series 5 is probably the one to have. As mentioned in the article, the Series 7 is overall a bit better, but in most cases the Series 5 will be good enough. If you can get it for a much better price, I think it will serve you well. What’s your thought on which is the best electric shaver for going bald on head? I am not sure which is the greatest like Braun Series 3, 5 or 7? Some people are telling me that series 9 is the answer for perfect shaving on the head. I am still undecided on series 5 and 7. If series 9 is only one, let me know. I think the Series 5 or 7 should work just fine. I do not shave my head, so I can’t compare them to a Series 9, but an additional cutting element shouldn’t make that much of a difference, especially when shaving short, fine hair like the one on the scalp. Hi, I use a series 5 and I hate it!! On some hair, instead of cutting, it pulls them and it hurts. i’ve been using it for almost 2 years and it still hurts when it pulls those hairs. happens 10-20 times at every trim. should I go with series 7 or series 9. Normally, as long as the foils or blades are not damaged or worn out, you shouldn’t experience any hairs getting pulled. You didn’t mention if this has happened right from the beginning when the razor was brand new. So if the shaving head of your Series 5 is still in good shape, there could be a couple of causes for what you’re experiencing. First of all, if you move the shaver too fast during a stroke, some hairs will get pulled. So try doing slower strokes. The second is excessively long facial hair. Electric shavers are designed to work on reasonably short stubble, so try shaving more often or use a trimmer beforehand if your beard is too long. I think you should try to solve the cause of this before upgrading to a new shaver. The Series 7 is a bit better, but not exponentially better as mentioned in this post. So if there’s nothing wrong with your shaver, a Series 7 likely won’t solve the pulling problem.